All the Visual Bible Study Helps and Maps in One Key Resource - Fully Reproducible! 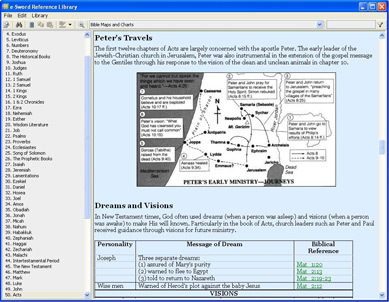 NOTE: Listed as "Bible Maps and Charts" under Reference Books in e-Sword Downloader. Nelson's Complete Book of Bible Maps and Charts, 2nd Edition, is packed full of visual aids that offer a deeper understanding of the Bible. By using the reproducible B&W maps, charts, tables, and surveys, you can visualize the events, places, and people in the Old and New Testaments. Whether you teach a Sunday school class, lead a Bible study, or just want to get to know the Bible better, this resource is a great addition to your study library. Your purchase allows you to reproduce these maps and charts in your digital presentations or print copies for your classroom or study group use! NOTE: for best results, do not resize images. The structure of the book is great as it reflects the sequence of the biblical books. I miss an interactive approach (no search function or bookmarks, annotations).. The quality or resolution of the maps might be higher. Some charts and tables are really great!! But the IPhone might not be the appropriate device to display them. The reference verses are very useful! Great for enhancing my Bible study. Love the Bible program but the maps add on that I purchased is not in the same league, shall we say. I wish I had spent my money on another version or a dictionary. I have not had enough time with the file to make a good study. This is a great book I really liked it. The charts are great too they helped me to understand what the bible was trying to say. Has a huge amount of awesome and useful information. I am very glad I got it. I found this book to be a tremendous help in my studies. Timelines and maps make my study of places, when and where easier when writing my lessons. Expect to take from 2 to 6 hours studying the layout to understand what is included in this product. Then just reviewing the information will be informative and extracting information to be used in Sunday School, Preaching, or personal study will be much more valuable. Although the number of maps is limited the information provided is well done. Some of the charts provide helpful information. I've been using eSword for years and love it! I have a leather bound Bible I used years ago that was published byThomas Nelson with the maps and charts in it and was my favorite paper Bible ever. I wore the binding out. This is a great resource for study that goes beyond devotional reading. I was disappointed that there weren't more maps in the set to cover more biblical eras. Not completely satisfied with it yet, still learning how to use it. Seems to be more charts than maps, but I'll keep working at it. The maps are very simalar to, if not the same, as the maps that I have had in esword a few years ago. I was thinking these may have been of better quality for the price. Still good to support a good ministry; therefore there is no real loss if you decide to purchase. The Book of Bible Maps and Charts is a very practical and useful tool, however, it is a little harder to locate within e-Sword compared to other tools like the commentaries and dictionaries. It is found under tools - reference library. It does have good maps, charts and other reference materials. With the colorful logo and title, I expected a good source for teaching materials. In fact, there is great reference material here, but the graphics are rudimentary, of low resolution (so projecting is a disaster)and I have not identified one color image yet. I suggest the name or description be changed to avoid this "buyer remorse." The title is Book of Bible Maps and Charts. I bought the book because I wanted maps. In this I was disappointed as what limited maps there are too blurry to use. However, all the text information and charts are worth the price. eSword HD have certainly made a difference in my daily Bible study. I have started to read the chapters along with the commentaries and it is indeed giving me a different perspective and understanding. Excellent tool for maps and charts. Content includes many items to include when studying or teaching. Well worth the cost! I have not used this program much at all, but so far I am a bit disappointed. I have the 1982 edition of this work in paperback. I was hoping for greater ease of use with the electronic version. My opinion may change after I have more experience with this program. I also wonder if there is less information in this electronic version than in the 1982 paperback edition. I got this for the maps and charts, but thes are rather blurred. This is a shame as it is as the title suggests the main part of this resource. However, the associated notes still make this a useful resource. This addition to my Bible studies makes my personal understanding where the stories are taking place much easier to follow. A MUST for any reader of the Bible. I have been using e-sword for about 8 years as a tool to prepare and lead bible study at our church. Having recently purchased the MacArthur commentary and the Nelsons Complete Book of Bible Maps and Charts for e-Sword PC has expanded and improved what is already a wonderful resource. Bible Maps and Charts is very well constructed and user friendly - it offers much more than the title indicates. I have just about all additions one can get for E-Sword, of which is really the only Bible study tool one would need since it was first made avaliable. Unfortunately - I have also thrown money away on so many "other popular" Bible programs to the tune of hundreds of dollars... To boil it all down - I should have stayed true and patient with E-Sword. It now has almost everything from eStudySource one needs for serrious Bible study, but with patience - other modules and additions will come. E-Sword may not be perfect... but its close! I have used the Nelson Complete Book of Bible Maps and Charts only once so far and find it a very handy companion to prepare the background material for our Bible Study Group. To be able to look at the information in the resource and find items that are not in my study bible adds depth to our studies as we try to find what it is that The Lord is saying to us. I'm so glad that I added this valuable resource to my new eStudy library. Just purchassed it and after some problems with download (be sure you have the latest v10.1 update installed) it looks good. I really like the review and notes on each book of the Bible. The maps and charts are not the clearest but do help understand just where the places are located or where battles took place. Very interesting to read and peruse. Glad to have this resource at my finger tips even though the diagrams are a bit blurred. Superb that it sits along side my other e-Sword resources. Although I have only just begun to go over the Nelsons Complete Book of Bible Maps and Charts, the chapters and the information inside each chapter, would be an excellent resource for timeline studies and teaching. I am a teacher and I think this information would be a very important resource for myself and my students. I was able to use Nelsons Complete Book of Bible Maps and Charts right away by copying and pasting maps into my Bible study document. I found the commentary surrounding the maps and books of the Bible most helpful as well. The maps are not in colour but still a great resource which has my recommendation. Great book! The only issue with the electronic transfer of this book on e-sword(found under the tools toolbar and then select reference library) is that you cannot scroll from left to right once the application is loaded. This may work great for most books, but one of the great things about Nelson's Complete Book of Bible Maps and Charts are the maps and charts! Some of these charts however, are bigger than what the screen shows and in order to view what cannot be seen you mut copy and paste into a new document and then shrink. Alot of work which could easily be remedied with the inclusion of a left-right scroll bar. Perhaps a later update of E-sword will improve my opinion and I can change my rating from 4 stars to 5! I've looked at the Maps, Charts and Graphics and I am thrilled. There is so much information that came included that was unexpected - my mouth waters just thinking about it. Can't wait to dive in, explore and put it to use! I was pleasantly surprised to discover that Nelsons complete Book of Bible Maps and Charts were "more than complete". I expected to see lots of charts and maps but there is much more packed in. It is easy to reference becuase it is listed by the books of the bible. Each book is presented with an overview, date, author, themes, outline, etc. At a glance charts, charts of various details in the book depending on the subject matter, timeline charts, various types of maps, some with detailed text boxes, book summaries and some commentary and much more. I love it and am enjoying using this wonderful reference. Great tool for teachers and students alike. Have had the paper version of this product for a long time. It will be so nice to be able to find stuff with a click of the mouse instead of paging through a rather large volume. Overall the reference is handy, well organized and with useful charts and maps. Happy reading!! I always have a hard time picturing where places are when I am reading the bible. These maps really make it nice to see not only what it looked like back in biblical times but what places are called and what it looks like today. Using Nelson's Book brings cities and regions to life as i read the bible. I always like to find the places within the pages as i read. This literally helps me visualise the places that Jesus walked, where Paul and Barnabas went to start all of the churches. The journney that Abraham made by God's command. The gift of the 10 Commandments. With the help of these maps and charts, there is overall a better understanding of the peoples lives and how they lived. It is a more complete overview of the Bible. Everyone should use this resourse when they read! When I purchased Nelson's Complete Book of Bible Maps and Charts I didn't know how broad its scope would be. Already I have referred to it several times in my personal study, and I can only imagine what use I may make of it in preparing sermons and researching for written works. Just another example of how e-Sword continues to make itself more useful and more user-friendly by offering such useful tools to us "field hands" at such nominal cost. Nelson's complete book of Bible maps opens the door of understanding to the Bible better than any commentary I have ever read. It gives complete outline on what this Bible book subject is dealing with which helps you to understand God's message to you personally. It helps you to make sense of your situation and circumstances because it deals with practical helps that you can put into your Christian walk and start living it. I was hurt on a construction accident and cannot physically work with books and these dear people from e-Sword and eStudySource have with these tools in such an easy format that even disabled people can use them without even the slightest problem. I have already shared much of what I have learned with the missionaries, pastors, and other Bible teacher across the world and they can't believe how smart I am. I highly recommend Nelson's Complete book of Bible Maps and it was well worth the small price I paid to get this well of knowledge. I am always looking for maps when I study the Bible. Nelsons has help me to bring it close to home. The ease of using the maps has really made it more personal. It is worth the money. This is a great resource to add to your startup library. I've had it for years and still use it today. The summaries, charts, graphs, outlines and maps are extremely valuable. You won't regret purchasing this. Love e-Sword and the modules that eStudySource offers. Use e-Sword to do searches in seconds that would otherwise take hours if not days. It helps me by having all my resources at my fingertips instead of spread out, cluttering the table and desk. The Editor, along with the verse list, is also very helpful for preparing for studies, word studies, etc,. Good stuff, has been around a long time, but still a good reference item. I have only just got the Nelson Maps&Charts and had a quick scan as one dose with a new purchase. My quick scan turned into over an hour of search and discovery. Though very basic in its layout it is packed with thought provoking information and facts. An ideal addition to my study resources. Another great addition to this fab bible program!I could not continue my ministery without the Holy Spirit to put flesh and breath onto the bones that I find by searhing E-SWORD! A bit disappointed at first in this publication - I expected the maps to be in colour, and I didn't expect to have all the supporting headings and charts. Then I thought of the price, and the description of it - Maps etc that have been reproduced from Bibles published by Nelson. All types of Bibles with study notes have the maps in black &amp; white - you only get coloured maps as an extra at the back of a Bible. Nevertheless, I did think that in 2012 we ought to be having coloured maps in software prepared for use on a PC. Since the cover was in color, I assumed the maps and charts would be, too. I was surprised that the maps are low resolution, too. This makes them less useful for reproduction. All in all, the charts and maps are useful and well done. Too bad it is not in color and higher resolution. I expect to use them despite the lack of color. Very easy to use, even for someone who doesn't like to look at maps - me. This is an excellent resource at a bargin price! Better map resolution and color would be a nice plus but still a great bargin! I finally figured out how to select a map or chart and print only that, not the entire page. The book contains many charts and maps, but no index. I never did find a map of the divided land of Canaan. I searched only a few minutes then moved on to another book of maps. There are no colors in the book which doesn't help when studying the dress of the high priest. These are minor points and I believe that the more I use the book, the more I will appreciate the many charts available. I have been using the Nelson's Complete Book of Bible Maps for several years, but did not have the luxury of having it on my computer. ESword is my program of choice. It is so convenient to have so many tools for my use. The addition of Nelson's is truly welcomed. I was thrilled to see this resource come availiable for esword. Preparation,research,and just for common bible study it brings to the library a must tool for the minister,teacher,and layman. Thank you for making such material availible. Anything that brings study to life the words of God is most gratifying to say the least. I have used this product in another Bible Program and was pleased that I could get it for e-sword. The price is extemely reasonable. I have used the product in e-sword and found that it surpassed my expectations. The ad caught my eye and I thought: "Neat... having the back of my Bible maps on my computer would be helpful." Imagine my amazement when I got a whole book of maps! They are organized for quick and easy access, great quality and thorough. It's the smartest buy I've made in awhile. This resource offers excellent value for money. It provides a comprehensive set of Time Lines, Charts, Maps, Overviews and Key Teaching Points that are on a par with those available in the print version of the Life Application Bible. Despite the lack of color the quality/price ratio is still high enough to justify my 5* rating. What's an added bonus is the printable nature of the charts and text as well as the ability to copy them into a document: handy for essays, sermons and Bible studies. I found Nelsons Complet Book of Maps and Charts a useful teaching and study tool to find the locations of various places in Scripture. It is good to have the ability to cut and paste maps and charts for handouts. The charts provide timelines and other key points that enhance the study of Scripture. An extreme wealth of information conveniently organized by book of the Bible and easily navigable. Highly recommended as good bang for the buck. I give it 3 stars because the map is black and white. Map resolution is too low. This is the first of what will hopefully be a large number of modules that make use of the newly added ability to put graphics and in topic or reference files. It is laid out with handy "Chapters" covering each book of the Bible as well as the Old Testament and New Testaments in general and the divisions of scripture (Pentateuch, Historical Books and so on for the OT), as section on the Inter-testimonial period, Pauline and General Epistles. The maps, discussion and charts are in these chapters making them easy to locate. The maps are pretty basic, but useful. The charts are very helpful partially because it is not just chats, but also background and exposition regarding the charts topics. As an example there are charts for the book of Revelation there is a discussion (rather basic yet decent) and a chart listing a comparison of Four Different Views on Revelation. Preterist, Historical, Idealist and Futurist with a single sentence summation of each. Another chart from the book of Daniel states It is important to note that the little horns of chapters 7 and 8 are two distinct persons. Several factors make this distinction clear:and charts the differences between the two in an easily understandable manner. The charts are not detailed, but good for quick summation for use in a small group or Sunday School class handout. The discussions and charts appear to take pains not to favor one point of view over another.